Septuagenarian Bhairon Singh Shekhawat today achieved a distinction of sorts by becoming the first declared follower of the Rashtriya Swayamsevak Sangh to reach the second highest constitutional position by defeating the joint Opposition candidate Sushil Kumar Shinde by a startling margin of 149 votes. The margin of Mr Shekhawat’s victory has surprised his friends and foes alike as he defeated Mr Shinde by securing 454 votes. Mr Shinde got only 305 votes thus belying expectations that there would be cross voting in his favour with Dalit MPs preferring him. The result showed that more than 45 MPs cross-voted in favour of the NDA candidate. The number of invalid votes in this election was also much less at seven as against 42 invalid votes in the presidential election. Among the 22 MPs who did not cast their votes were nine from the Trinamool Congress, Dr Jayant Rongpi of CPI (ML), Mr Simranjit Singh Mann, Ms Maneka Gandhi, Lata Mangeshkar, Mr Narendra Mohan, Mr Pappu Yadav, Mrs Ganti Vijya Kumari (wife of former Lok Sabha Speaker G.M.C. Balayogi) Mr Mrinal Sen, Shabana Azmi and Mr Sudheeran. Last-minute efforts by the NDA to persuade Trinamool leader Ms Mamata Banerjee to vote in favour of NDA candidate also failed. Prime Minister’s emissary Mr Vijay Goel who met Ms Banerjee at Jantar Mantar failed to convince her. Mr Goel requested her to talk to the Prime Minister but Ms Banerjee refused to do so. Mr Ajit Panja and one more member of the Trinamool Congress voted. Earlier, the ballot box was sealed in the presence of Minister of State for Parliamentary Affairs Santosh Kumar Gangwar and Congress leader Suresh Pachauri. External Affairs Minister Yashwant Sinha, who returned from Kabul, drove straight from the airport to Parliament House to cast his vote. 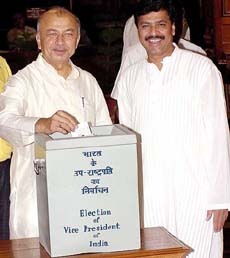 Mr Sinha and film thespian Dilip Kumar, a Rajya Sabha member, were among the last few voters to exercise their franchise. Nearly half the electoral college had voted in the first hour of polling this morning. 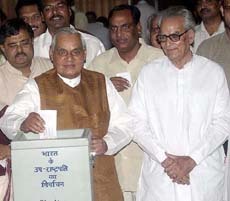 Among the early voters were Prime Minister Atal Behari Vajpayee, Deputy Prime Minister L.K. Advani, Speaker Manohar Joshi and Congress President Sonia Gandhi. The Prime Minister was accompanied to the polling station in Parliament House by Finance Minister Jaswant Singh and Mr Shekhawat. After a brief lull in polling when both Houses met, a flurry of activity was seen in the polling station with both Lok Sabha and Rajya Sabha being adjourned sine die. Prominent leaders who cast their votes included former Prime Ministers H.D. Deve Gowda and Chandra Shekhar, Deputy Speaker P.M. Sayeed, Leader of the Opposition in Rajya Sabha Manmohan Singh and Sunil Dutt. Newly elected Rajya Sabha member P.C. Alexander and rebel Trinamool Congress member Ajit Panja also voted in the first hour. Parliamentary Affairs Minister Pramod Mahajan, who was present at the polling venue to inspect the arrangements, was the first to cast his ballot. Marumalarchi Dravida Munnetra Kazhgam (MDMK) leader Vaiko, detained under the Prevention of Terrorism Act (POTA), also voted. Mr Vaiko, the trademark black shawl draped on his shoulders, came to room No 63 in Parliament House at about 1.30 pm. Lok Sabha Secretary-General G C. Malhotra was the returning officer for the election. At a time when the nation is shocked over the ‘sati’ allegedly committed by a 65-year-old woman in a village in Madhya Pradesh, the countrymen could cheer today over the election of Mr Bhairon Singh Shekhawat as the 12th Vice-President, a man who vehemently opposed ‘sati’. The veteran BJP leader, who was the vice-presidential candidate of the ruling NDA, had virtually staked his entire political career by vehemently opposing the movement in support of ‘sati’ after the Deorala incident in 1987. At a time when emotions were charged and supporters wanted to glorify ‘sati’, it was his voice of sanity which defused the situation and made people see reason. Mr Shekhawat, who had a long road to travel to attain the second top-most constitutional position, is also well known for his whole-hearted support to the Jagirdari Abolition and Resumption Bill when it was introduced in the Rajasthan Assembly in 1952, despite himself being a jagirdar. Born on October 23, 1923 in a farmer’s family in Khachriawas in Sikar district of Rajasthan, Mr Shekhawat has indeed come a long way in life as a veteran political leader and a senior statesman. Having lost his father at an early age, he battled all odds and shouldered the responsibilities of his family. His straitened circumstances forced him to abandon his education after high school. He served as a constable in Rajasthan police, before plunging into politics. He joined Bharatiya Jan Sangh in 1952 and remained MLA in Rajasthan Assembly from 1952 to 1972 and from 1977 till date. He was a member of Rajya Sabha from 1974-1977. The fact that he was the Chief Minister of the state thrice, is perhaps a reflection of the immense popularity he enjoys in his native land. The man, who was instrumental in establishing the BJP in Rajasthan, served the state as the Chief Minister from 1977 to 1980, from 1990 to 1992 and from December 1993 to 1998. His first two tenures as Chief Minister were cut short due to dissolution of state Assembly by the Union Government. It was his personal stature, sagacity and unimpeachable integrity, coupled with consummate and fabled political skills, which enabled him to successfully steer the three coalition governments. Mr Shekhawat was imprisoned for 19 months during Emergency. The Vice-President-elect Bhairon Singh Shekhawat today said he would run the next session of the Rajya Sabha as per rules and keeping with the high traditions. Speaking to newspersons soon after he was declared elected as the next Vice-President, Mr Shekhawat expressed happiness over the victory margin.